Hurricanes are one of the most destructive forces in nature, with the ability to destroy homes and entire communities in just a few hours. This sudden loss of your property and the emotional toll it can take is devastating, but having a homeowners insurance policy should offer you some piece of mind knowing that hurricane and tropical storm damage is covered. However, that may not be the case. You could end up being victimized twice through no fault of your own. Attention home and business owners: have you suffered property damage after the last hurricane? Has your insurance company lowballed or denied your claim? If so, our hurricane insurance lawyers may be able to help. Visit HurricaneLawyer.com to learn more today. Even though you pay for insurance each month, when you need it most the insurance company may try and find a way to pay you as little as possible, or avoid paying altogether for the damages sustained to your property. Hurricane season lasts from the beginning of June until the end of November, according to the National Hurricane Center. Since 1968, the number of named storms that form each year on average is 11.8, and the number of major hurricanes is about two on average. In the face of these often devastating storms, homeowners along the coast and other areas susceptible to hurricanes must make sure they know what their insurance policy covers, and what to do after the storm, so they can begin rebuilding. Hurricanes bring with them strong winds and heavy rains. After these natural forces move through an inhabited area, it may look very similar to a war zone. For example, strong winds may leave the streets littered with shingles torn off houses, downed power lines, uprooted trees, and mangled traffic signs. The extent of the damage will depend on the strength of the hurricane, which can be numbered from one to five based on the strength of the storm’s wind speed. Regardless of the strength though, hurricanes have five main hazards people should watch out for when it comes to property damage. Wind speed is the determining factor of hurricane strength, and arguably its most dangerous hazard. Hurricane strength is based on the Saffir-Simpson Wind Scale, which outlines the category number, and the type of damage that could be expected at each level. Category 1: Storms with wind gusts above 74 mph are considered a category-1 hurricane, and are strong enough to damage roofs, shingles, vinyl siding, and gutters. Large branches of trees may also snap and shallowly rooted trees may be blown over. There may also be extensive damage to power lines and poles that will result in power outages. Category 2: Storms with wind gusts that go above 96 mph are considered a category-2 hurricane, and can cause major roof and siding damage to homes, uproot trees, and severely damage power lines. Category 3: Storms with wind gusts that go above 111 mph are considered a category-3 hurricane, and can cause more extensive damage to homes than a category-2 hurricane. These storms can uproot deeper rooted trees, and almost certainly knock out electricity and water. Category 4: Storms with wind gusts of more than 131 mph are considered a category-4 hurricane, and can cause severe damage to homes with the loss of most of the roof structure and even some exterior walls. Most trees will be snapped or uprooted and power poles downed, which may make it difficult for rescue workers to reach some residential areas. Category 5: Storms with wind gusts above 155 mph are considered the most dangerous. Only three category-5 hurricanes have made landfall in the U.S., with Andrew being the most recent in 1992. These hurricanes have the power to destroy well built homes, causing things like total roof failure and wall collapse, while also toppling more deeply rooted trees, and turning street signs into dangerous projectiles. Hurricanes are also known to bring with them torrential rains that can drop a few inches to several feet in just a short period of time. The amount of rain does not have anything to do with the strength of the storm, but rather how fast it is moving. Slow moving storms linger over a given area longer, and so more rain falls. The amount of rain could be compounded by other factors that can destroy cars, cause water damage in homes, crack building foundations, and in the most severe situations leads to people drowning. Unfortunately, even the best attempts to protect one’s property will likely end with some kind of damage in the event of a hurricane. If your home or business is damaged in the storm, you will want make sure you take the following steps to ensure your insurance claim is handled promptly in a fair manner. 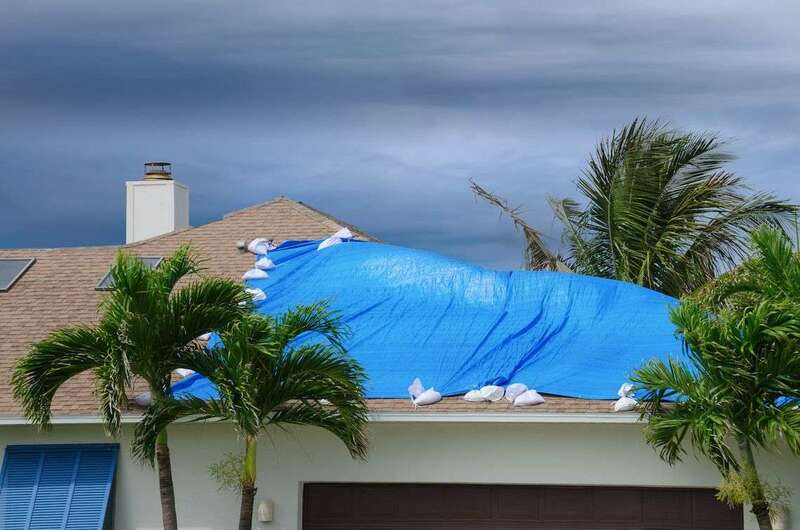 Cover Up Your Damaged Property It’s important that if your property sustains any damage, that you cover it up with a tarp or something similar to prevent water intrusion or any other further damage. Remember, the insurance company will take any reason it can to avoid paying you, and if they claim your damaged property became more damaged after the storm they may blame you for the damage and deny your claim. Document Everything It is recommended that you start outside and get your entire house in each shot — all four sides and as much of the roof as you can. Make sure to take photos of your entire yard, also. Start by taking wide shots of the yard, then move in closer to take shots with more detail. Then, head inside and start taking photos there. Start by taking photos of entire rooms, then move on to taking photos of individual items. A complete photographic record is important to being able to prove losses if you need to file a claim. As you take your photographs, make an inventory of damaged property. This will also help with your claim. File Your Insurance Claim Promptly Insurance policies typically require you to act fast after storm damage. This is why it’s paramount that you take your photographs, write your inventory, and file your claim as quickly as you can. Generally, there is no such thing as hurricane insurance because the standard homeowner policy typically covers wind damage, and flood insurance is something bought separately. What is covered by the homeowners policy differs by state though, so be sure to know what the insurance rules are in your state. For instance, in Florida a general homeowners policy will cover wind damage, meaning if your roof or siding is ruined by the wind the damage will be covered. However, there is a special deductible for hurricane damage in Florida, which is set at a fixed percentage based on the amount of the entire policy, and must be met before the insurance starts paying for damage. This is just one state though, and if you live somewhere else the rules will be different. This uncertainty is good for the insurance company though, because it will attempt to exploit them and claim it is not liable for some damages. When so many people are filing insurance claims as they would after a hurricane, the insurance company is looking to limit the amount of money they are on the hook for. This will cause them to deny claims and issue low ball offers even when they shouldn’t. As a result it is extremely important to read your insurance policy thoroughly so it is clear what is covered and what may require a separate policy. This is also important to do because if the insurance company does deny your claim or issue a low ball offer, you will know they are being dishonest. If you encounter any of those problems — or any other dispute with your insurance provider— handling things on your own may be time consuming and difficult. If you don’t have the savings to do the repairs yourself the insurance money is essential to your ability to rebuild. Alternatively, using the savings you worked for all your life on repairing hurricane damage will hurt your ability to pay for college, or even just take the vacation you deserve. This shouldn’t be the case though, because the insurance company most likely does owe you money. If you experienced any of the above response from your insurance provider won’t hesitate to contact us for a free, no-risk case evaluation. We’re here to help keep insurance companies accountable, and give you the opportunity to get your life back on track.